Secure first end of one piece of bracing into position using 30mm x 2.8Ø Multinail galvanised reinforced head nails. Stretch the Flat Tension Bracing over the panel to be braced, ensuring the brace is taut. Secure the second end while maintaining tension on the brace. Repeat this procedure for the remaining pieces of Flat Tension Bracing, ensuring an ‘X’ is formed. Secure the Multi-Tensioner in each length of Flat Tension Bracing to remove any remaining slack. 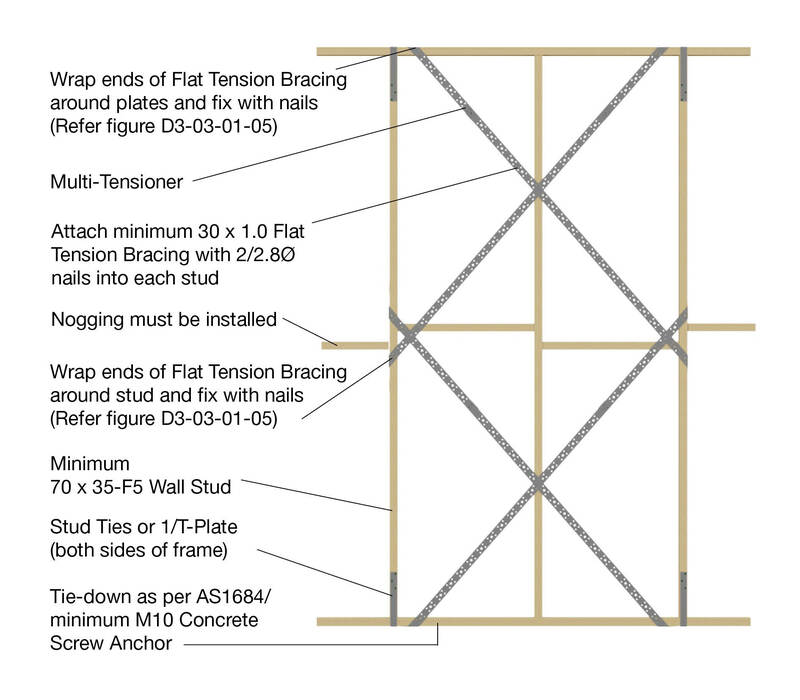 Fix T-Plate, Stud Tie or Nail On Stud Tie as required (refer individual Multinail product brochures). Please use the relevant Standards to determine the number, location and tie-down of bracing units. Bracing capacities stated are relevant for wall heights up to (and including) 2.7m. For wall heights greater then 2.7m, please refer to AS1684.